Two part system comprising an adhesive and aerosol activator. Superior joint adhesion on most surfaces such as wood, MDF, plastics, rubber, PVCu and metals. 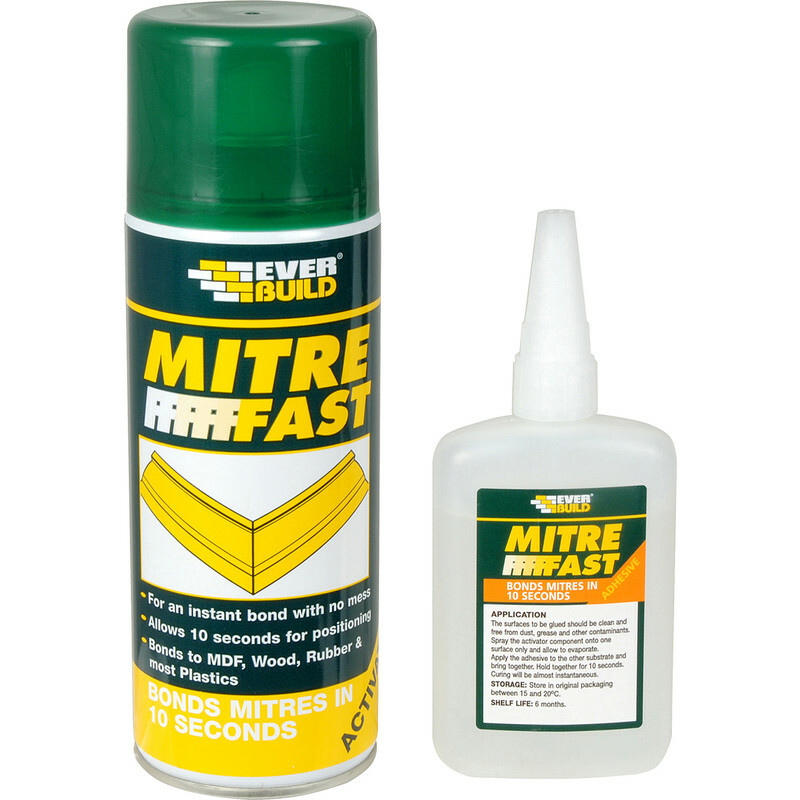 Mitre Adhesive Kit 50g + 200ml is rated 4.7 out of 5 by 34. Rated 1 out of 5 by vlnny from Need to use straight away I have used screw fix mitre glue but first time toolstation. Unfortunately the second time I used it about a month later the lid was solid on the bottle had to use mole grips to remove (lid totally unusable) and the snip the nozzle right down to the base to get the glue out. The screw fix although slight more expensive was usable for several months later. I don't expect it to be usable the next time. Rated 5 out of 5 by Ramon from Excellent adhesive A friend of mine recommended this type of adhesive and have found the EverBuild MitreFast very effective almost instantaneous and reasonably priced. Rated 5 out of 5 by Lathers from Not only for mitres. Reliable, quick setting super glue. Ideal for all wood joints. It appears that Mitre Fix may be used for any subject that any superglue sticks. Rated 5 out of 5 by Moggsy from useful tool Always was an excellent product, useful for many sticky problems, found nothing it won't stick yet. On offer so bought 3!! in case they are not going to be stocked again. This product is better than the more expensive item stocked. Rated 5 out of 5 by Gnat from Does exactly what it should Fantastic product that works very well indeed & would recommend this to anyone who needs a fast acting glue that holds well.